I would like to see hats brought back to their place in fashion history. – Barbara Troeller, milliner and hat historian. It seems Ms. Troeller is doing her best to put those hats back atop our heads. As a hat historian and milliner not only does she make hats she restores antique ones as well. Her love of the chapeau started as a teenager when a gift of a 40s hat from her sister sparked thoughts of – Who made this hat? Who wore it and where? That curiosity remained as Ms. Troeller successfully created a career in hats, first by collecting them then learning how to create hats herself at New York’s Fashion Institute of Technology. Ms. Troeller has been featured in many a magazine, including Victoria where I found today’s quote. Her website, Rue de la Paix is worth look-see. She was a big person on buttons because her mother, being a dressmaker, always taught her that good accessories count. – Cynthia Crawford, assistant to Margaret Thatcher (1979-2013). Some of Mrs. Thatcher’s belongings, including much of her wardrobe from her years as Prime Minister, are going up for auction. Handled by Christie’s, the sale is set for December 15, 2015 in London. I’m big on buttons and accessories as well. Both can shift an outfit from drab to dramatic. This is particularly true when it comes to suits, which might be a little conservative/boring. However, sometimes there’s nothing more elegant or appropriate than a well-tailored suit punctuated with the right accessories such as a colorful scarf, a rakish hat, a stunning brooch, or distinctive buttons. That goes for the fellas, too. The classic men’s suit can handle a twist of individuality in the form of a snazzy waistcoat, a pocket square, a patterned tie or, better yet, a bow tie. We love a gentleman bold enough to sport a bow tie! Designs by Sonia Delaunay in 1924. The craft of fashion is not yet constructive, but rather multiplies details and refinements. Instead of adapting the dress to the necessities of daily life, to the movements which it dictates, it complicates them, believing that it thereby satisfies the taste of the buyer or exporter. – Sonia Delaunay (1885-1979), Russian born artist and fashion/textile designer known for her use of bold colors and geometric shapes. 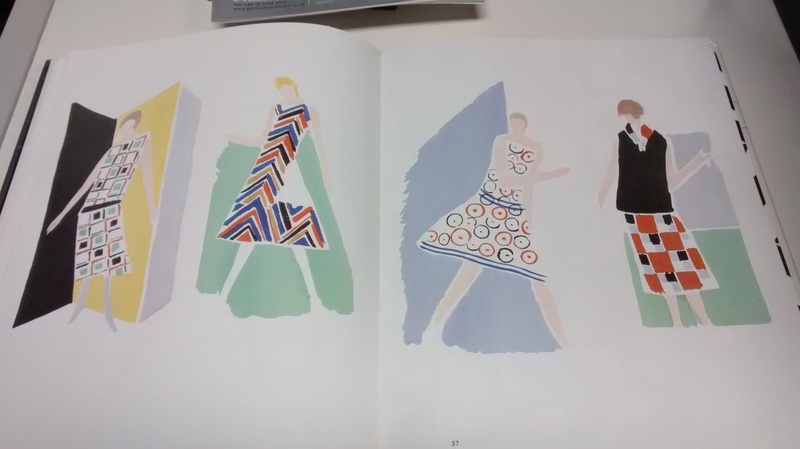 Sonia Delaunay fashion plates from Sonia Delaunay: Art into Fashion. I found this quote in the book, Sonia Delaunay: Art into Fashion (George Braziller, Inc., 1986). Ms. Delaunay was speaking of fashion trends in 1931. She and her husband Robert, also an artist, believed in simultaneity in art, the idea that two designs placed next to each other affect one another. She applied this to her textile and fashion design, keeping in mind how the design of the fabric would work with the construction of the clothing. (This was unheard of in fashion at the time as each component of fashion design was thought of separately.) She took the next step in also considering how her fashions might be worn by women, who in the modern era were much more active than previous generations. 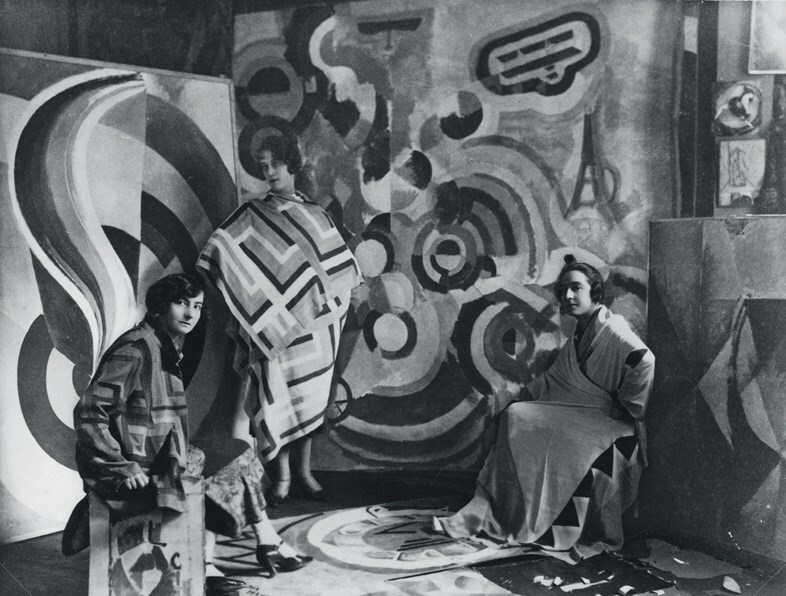 Sonia Delaunay is where fashion plays with art and everyday life. Speaking of museums, I just spent the best day at the de Young checking out Jewel City: Art from San Francisco’s Panama-Pacific International Exposition (PPIE) now on view through January 10, 2016. Jewel City features some 200 paintings, sculptures, illustrations, and photos of the 20,000 originally included in the 1915 exposition and housed in the Palace Fine Arts. PPIE was intended to celebrate both the opening of the Panama Canal and the reconstruction of San Francisco after the 1906 earthquake. 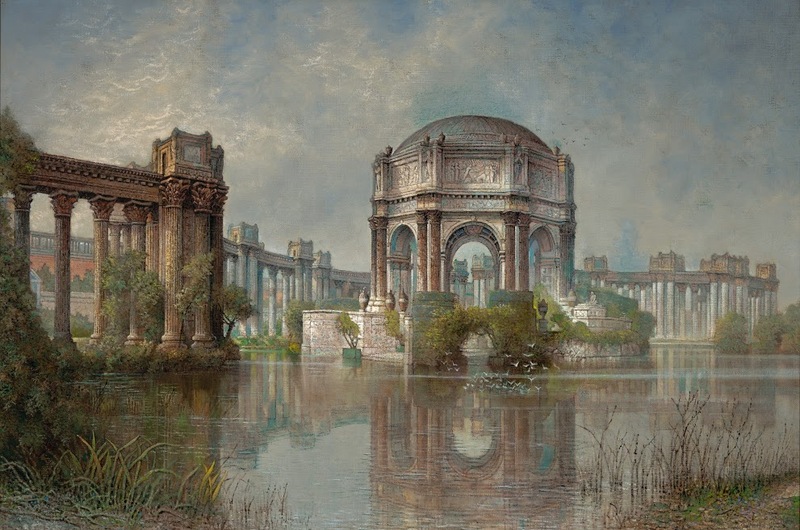 This was a treat for me because as a child I often walked to the Palace of Fine Arts with my dad to feed the ducks and saunter around, awestruck by the size and magnificence of this historic building. But I have never really known how the building was used for the exposition and certainly I’ve never seen the collection exhibited. In fact this is the first time since the exposition that any of the collection has been on view together. Arthur Frank Mathews (1860-1945), The Victory of Culture Over Force, 1914. The exhibit is split into a series of galleries based on region and style, for example California artists, French, Italian Futurists. Many pieces are from the San Francisco of Fine Arts Museums’ own collection and others are on loan. Among my favorites were the illustrations advertising the exposition and the Arts and Crafts aesthetic reflected in the California Gallery. I was also attracted to the Hungarian Modernism Gallery, which was a definite shift from the others for its edginess. Considered Avant Garde at the time, the style was quite a shock to 1915 viewers. 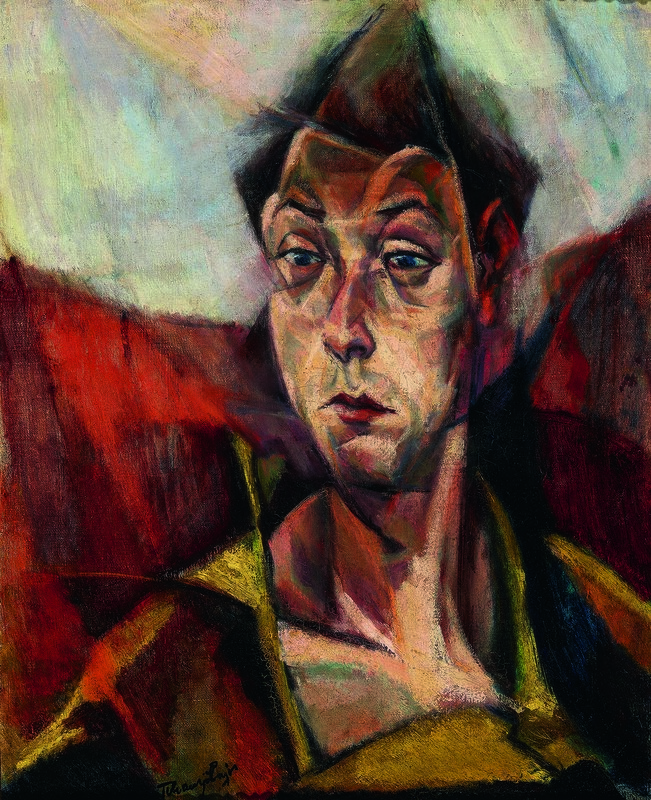 Self Portrait by Hungarian artist Lojos Tihanyi (1885-1938). Jewel City: Art from San Francisco’s Panama-Pacific International Exposition at the de Young Museum in Golden Gate Park. I suggest going on a Friday afternoon and staying into the evening when the museum stays open late and has live music and other fun and engaging activities. Click here for more information. When you see so many celebrities penetrating fashion brands – as well as celebrities becoming fashion labels themselves – you wonder, is there anybody left to carry on the tradition of creating real clothes? 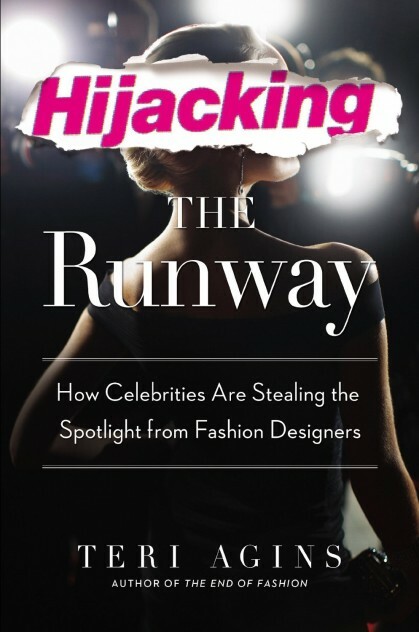 Teri Agins, fashion journalist for the Wall Street Journal and author of Hijacking the Runway: How Celebrities Are Stealing the Spotlight from Fashion Designers (Gotham Books, 2014). Some designers, like Michael Kors, are making themselves into celebrities and many celebrities are pretending to be designers causing chaos and confusion on multiple levels. Still there are a few who refuse to join the madness. Derek Lam for example doesn’t invite celebrities to his shows and doesn’t seek celebrity status himself. For this designer, it’s just about the clothes.